Dinosaurs and people didn’t co-exist (unless you’re a young-earth creationist and you think they did), but for most of the world, they are known to be separated by millions of years. But according to screenwriter Meg LeFauve, the asteroid 65 million years ago that wiped out the dinosaurs was a near-miss and didn’t hit the earth. So the dinos never went extinct, which is why this cute little movie now has an excuse to tell its story. The setting seems like somewhere out of the old American West. There lies a long-necked family of apatosauruses. “Poppa” (Jeffrey Wright, voice) and “Momma” (Frances McDormand, voice) are looking out for young, un-intimidating “Arlo” (Raymond Ochoa). 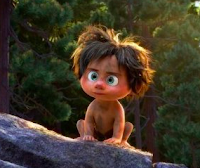 When an unexpected flood washes Poppa and Arlo out of a ravine, little Arlo is left on his own. Making their way together through the increasingly dangerous wilderness, narrowly escaping vicious raptors and a hungry gaggle of pterodactyls whose leader is “Thunderclap” (Steve Zahn, voice), the two come across a strange assortment of creatures, including a pretty-pink cobra and a styracosaurus (Peter Sohn, voice) who can camouflage. After getting a hold of some highly hallucinogenic delicacies, Arlo and Spot run into some friendly, cowboy-style tyranosauruses, whose leader, “Butch” (Sam Elliot, voice) has the lesson handy we saw coming on how fear will be present, but simply shouldn’t be yielded to in times of crisis. This is Pixar’s sixteenth animated feature film, and although very cute and touching in some key places, it is barely worth the watch. It borrows heavily from The Land Before Time, The Lion King, Bolt, and The Jungle Book. The plot never dares to be or to do anything outside of what we expect. No, the younger viewers won’t know the difference, but we’ve come to expect more from Pixar. The technological recreation of mountain ranges, caves, rivers, and enchanting landscapes are impressively done, but tech specs and “aw, isn’t that sweet” moments do not an effective movie make. Add to that, the initial problem that the apatosaurus family had is never solved by the movie’s end. But again, young enough viewers may not even notice.